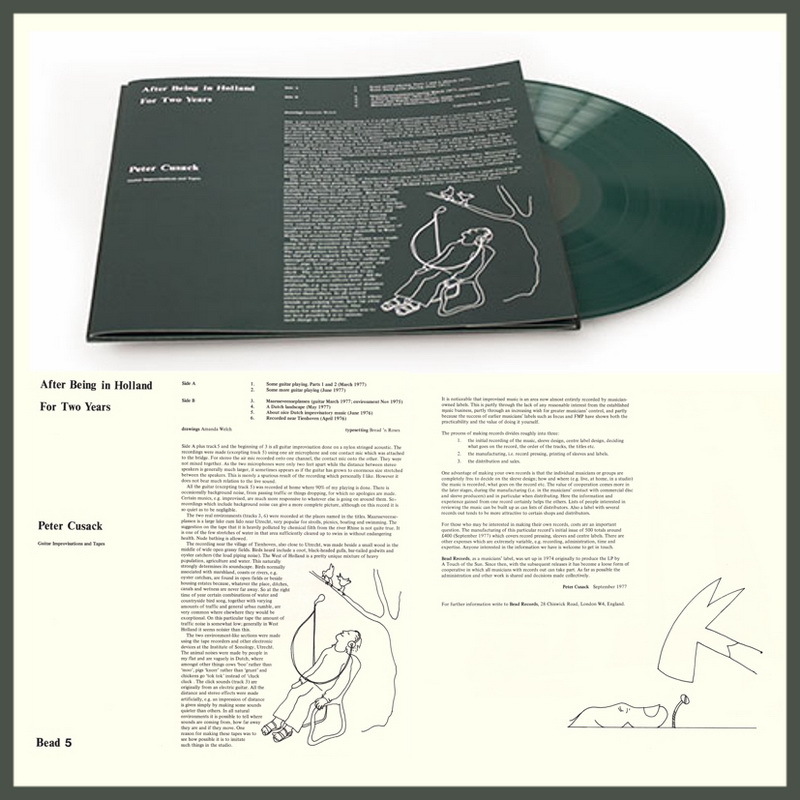 Ristampa in vinile anche per il primo album di Peter Cusack, After Being In Holland For Two Years (1977): allora uscì in proprio per l'etichetta Bead, oggi lo rimette in circolazione Blume in elegante edizione a tiratura limitata. Peter Cusack’s debut long player from 1977 is a peak into one of the most varied and experimental musical scrapbooks you are likely to hear. Infused with natural sounds and a healthy dose of musical abstraction, it is difficult to pigeonhole this record into any genre. It is the kind of record you wished existed while nothing really came close to the mark. A solo album of guitar and environmental sounds, a montage filled with montages where references to and resonances of varied, often disparate soundworlds spill in every direction. The music manages to be both blatant and covert at the same time; it’s clearly, acutely disjointed and polyvocal yet strangely out of focus in regard to intent. But that’s a thing about montages: by having nothing lead causally, conventionally to the next, a radical, imaginary simultaneity occurs; you continue to experience the presence of each previous section (even though you no longer hear them) even as a new one abruptly presents itself - all this without the actual physical interference that happens with collage.